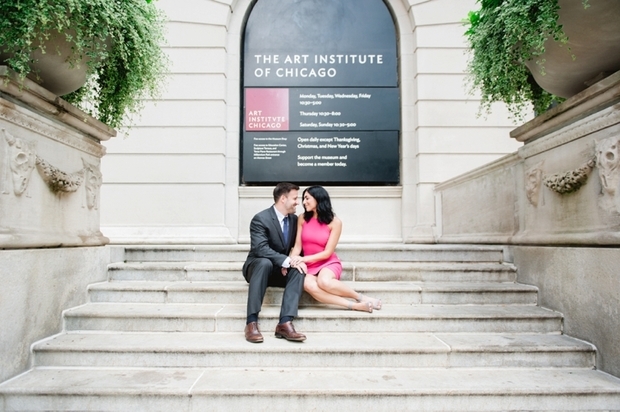 I was fortunate enough to spend an incredible afternoon with these two gorgeous individuals, strolling around The Art Institute of Chicago gardens, capturing the sparks these two share. As you can see, love was in the air. These two are so sweet, funny & we got along swimmingly. Sarah works in fashion and totally rocked her Alice & Olivia cocktail dress. Doesn’t it look awesome against the greenery? Jay rocked a dapper look, which was much appreciated. That day was a scorcher and he was such a trooper. I am really looking forward to their intimate wedding this October at The Violet Hour in Chicago. Sarah is getting ready at one of my favorite Chicago hotels (it’s a secret!) & I cannot wait to photograph their first look there.